Not all the Herculaneum people had water at home and so their use of the thermal baths was a true necessity. But at the same time this was an authentic phenomenon of custom; an expression of a particular conception of free time. People went to the thermal baths not only to have a soak, but also to stroll, eat, meet friends, make conversation, make acquaintances and seek political support. The thermal baths offered, therefore, an occasion for social life in an area which naturally provided and facilitated it. The following were offered: hot baths, swimming pools, saunas, massage parlours, toilettes, gymnasiums and porticoed spaces. At the entrance people paid a modest fee; also free entrance was given to young people and there were different prices for various services like: cloakroom, massage, provision of perfumed oils. Generally men and women had separate sections. Entrance was after 1:30 p.m. Women, however, took their turn, generally, in the morning. 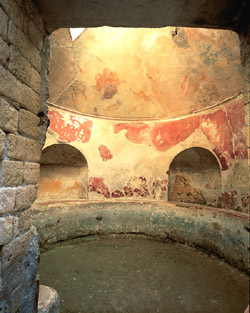 The baths remained open until the late afternoon. Oil lamps were used to illuminate the areas in the evenings. After leaving their clothes in the ‘apoditèrium’ or changing room, the Herculaneum people went to the swimming pool or to the gym. When they had finished doing physical exercises they went back to the swimming pool or went into the room with hot baths called the ‘caldàrium’. This was often near the ‘laconicum’ that is, Turkish baths, where the temperature was very high indeed. These rooms were heated, for hot air flowed from a boiler along the space under the raised floor and along spaces between the walls. The Herculaneum people would then have a rest in the ‘tepidàrium’, a temperate environment, and then they would move on to the cold baths in the ‘frigidàrium’. For these sessions, certain equipment were needed: linen or woolen towels, soda-used in place of soap-, perfumed oils and a ‘strigil’, a metallic curved blade for cleaning the body which was most likely ungent with oils and covered with sand after gymnastic exercises. The people working here were attentive to hygienic conditions, time-tabling of sessions and correct maintenance of the baths.